Defenses are often classified according to the step of the predation cycle they interrupt. A typical predation cycle is outlined in Figure 1, consisting of five steps that a predator must take to successfully capture prey: (1) it must be healthy and hungry enough to search for prey, (2) it must encounter prey, (3) detect it, (4) attack it, and (5) capture and consume it. Defenses can accordingly be classified into the following five classes. Figure 1 Classification of defenses (in black) according to the steps of the predation cycle (in gray) that they interrupt. 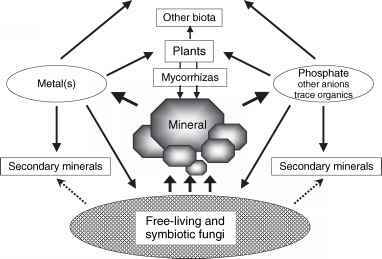 toxic substances that increase predator digestion time and thus reduce the motivation to search for the next meal. 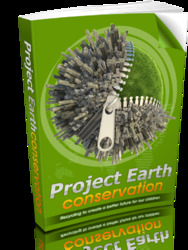 In extreme cases, predators become sick or even die due to toxic prey substances. (B) Prey armor, weapons, and flight behavior: they increase predator handling time, that is, the time needed to attack, capture, and consume a prey individual. Note that step 1 defenses are not advantageous for the consumed prey organisms themselves unless these are modular and a predator only ingests some modules (e.g., corals). However, these defenses can be evolutionarily adaptive in clonal prey such as Daphnia spp. (Crustacea Figure 2) or as a result of kin selection. 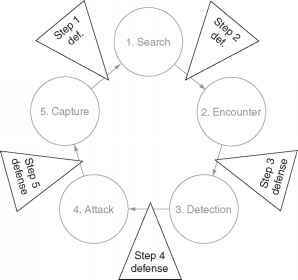 Nonetheless, step 1B defenses are simultaneously and usually primarily step 5 defenses (see below). Step 1 defenses are especially advantageous at intermediate prey densities: their effect is small at low densities because there, predation rate is limited by factors other than handling or digestion time (namely by the encounter rate between predators and prey, the probability to detect and attack prey, and the probability that an attack is successful); at high prey densities, on the other hand, predation rate is limited by handling or digestion time even if the prey are undefended. In other words, safety-in-numbers (also called the dilution effect) overrides the effect of step 1 defenses at high prey densities, making them unnecessary there. 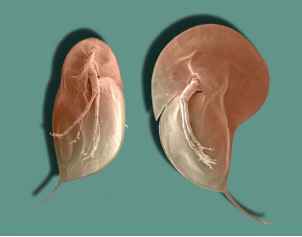 Figure 2 Daphnia longicephala develop a large crest as an inducible step 1B, 5 defense which increases the handling time and reduces the attack efficiency of invertebrate predators (left: undefended morph, right: defended morph). © Laforsch. Figure 3 Daphnia and many other planktonic species show diel vertical migration. 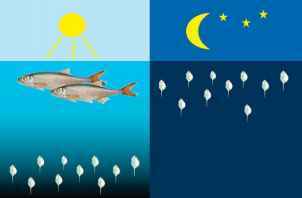 During daylight hours, they avoid the upper layers of the water body if they are populated by planktivorous fish during that time. At night, the fish do not hunt due to the lack of light, so the Daphnia can migrate to the upper layers of the water body and forage for algae. Diel vertical migration avoids encounters with predators; it is an example for an inducible step 2 defense. © Tollrian. since visually hunting fish need light to successfully capture prey, they forage in the upper layers of the water body during the day. Daphnia can avoid them by spending the daytime in the lower layers of the water body and foraging for algae at night in the upper layers when the fish are no danger due to the lack of light. The encounter rate between predators and prey mainly depends on the speed of the organism that moves faster. Therefore, slow movements or no movement at all reduce the encounter rate especially when the predators themselves have a slow foraging speed or none at all, for example, when they have a sit-and-wait hunting strategy. Some researchers believe that sleep functions as a step 2 defense as well. A number of animals have evolved the ability to produce resting stages, for example, Daphnia can produce resting eggs under unfavorable conditions. Although it might not be the foremost function of such resting stages, they can also serve as life-history defenses that avoid encounters with predators during periods of high predation risk. Step 2 defenses are especially beneficial at low prey densities because the above-mentioned dilution effect becomes stronger with increasing density and makes the defenses less advantageous under crowded conditions. The same is true for step 3-5 defenses. Thus, defenses affecting the steps 2-5 are generally more beneficial at low than at high prey densities.